Living in a world that seems to be devoid of peace, love and hope can make one feel helpless and scared, especially those of us who are young and have much of our lives still ahead of us. But, my three-day trip to Loyola University Maryland in Baltimore to take part in the Catholic Relief Services (CRS) Student Ambassador Leaders Together (SALT) Summit made me feel the opposite of helpless and scared. I came out empowered and impassioned with the mission of God. I had no clue what to expect since I am a relatively new CRS Student Ambassador for my school, Cabrini University. But, I couldn't have picked a better opportunity to embark upon. It was such a transformative experience to watch other young adults put so much of their time, effort and dedication into global issues. Together we create an impact. Together we bring peace, love and hope through Catholic social teaching. Together we make tomorrow a better place. Our first day of the CRS SALT Summit was a big night for some colleges as we presented on many topics via delegation presentations, including designing simulations and advocating on campus. Each ambassador in the crowd was busy jotting down notes from different presentations in order to take back some of the ideas shared to their own school setting. I think these presentations are what made me truly understand how much young students care about the world we inhabit. The intelligent, thoughtful questions tht were constantly posed throughout the summit put hope back into my heart as I thought of a greater purpose as to why we are here on Earth. On the second day, all of the ambassadors had the amazing opportunity to head down to CRS Headquarters in Baltimore to hear some powerful talks from CRS staff and partners around the world on human trafficking, climate change and refugees. What really stuck out to me was the human trafficking presentation. I have been advocating on and addressing the issues of climate change and refugees for almost a year now yet had not given much thought to this other serious problem plaguing our world. Now it will be another part of my mission to bring awareness and change for those who are trafficked. We ended our stay at CRS HQ with an awe-inspiring speech from CRS President and CEO, Carolyn Woo. Cabrini University's mission is education of the heart, and Dr. Woo did just that as she insisted that we not buy into the narrative of fear but rather serve others as God calls us to do. Her words ignited a fire in all of us to cultivate our spiritual lives and to go forth with strength. As our last day kicked off, I felt that CRS had prepared me for this next exciting step: we embarked on a trip to Washington, DC for lobbying visits! With the power of knowledge and passion, the CRS Student Ambassadors were ready to take on our U.S. senators and representatives to convey to them our mission of working toward a better future for all. Addressing issues of climate change, refugees and human trafficking, I watched as my advocacy teammates lived out the words of Dr. Woo. There was no ounce of fear in our hearts (maybe just some butterflies in our tummies! ), and we strived to effectively advocate in order to serve others and be the change we wish to see in the world. I am so impressed by the work other schools are doing and how CRS appreciates the dedication we have by providing us with these opportunities and outlets to express our love for creating a better tomorrow. We all have a greater purpose in this live, and I believe God made us that way--with empathy for others, with passion for the lives we live, and with a desire to create a world of togetherness. After all, Romans 12:2 reminds us, "Do not conform yourselves to the standards of this world." CRS and its ambassadors are living out this verse. We aren't conforming to the sad, scary standards of this world. Instead, we are changing the standards of this world. With faith in a better tomorrow, with hope of a brighter future and with hearts full of God's merciful and loving presence, we walk forward together. 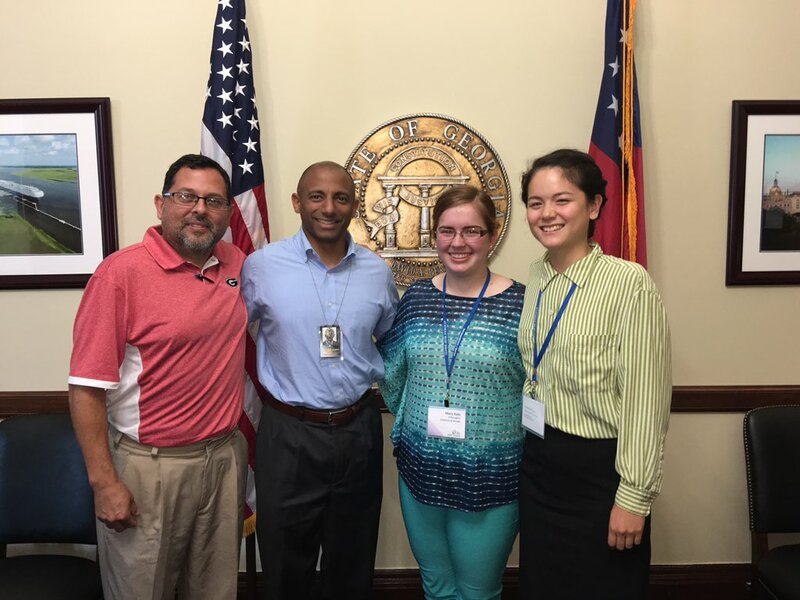 University of Georgia Ambassadors and Advisors participate in advocacy visits on Capitol Hill.